Preheat the oven to 350 degrees F. Melt the butter, then combine the butter, flour, brown sugar and pecans by stirring with a fork. Bake for about 15-20 minutes, just until the crust begins to brown around the edges. Remove from oven and cool completely. In a medium bowl, mix the cream cheese, powdered sugar, and heavy cream using a hand mixer until smooth. Spread over bottom of the cooled pecan pie crust. Combine the sugar, cocoa powder, cornstarch, flour, and salt in a medium saucepan and whisk well. In a separate bowl, combine the egg yolks and milk and whisk well, then add to the sugar and cocoa powder mixture in the sauce pan, whisking to combine. Cook over medium heat, whisking constantly until pudding begins to thicken and bubble, about 7-10 minutes. Remove from the heat and add the butter and vanilla, stirring just until the butter is melted and combined. Transfer the chocolate pudding to a shallow bowl and cover with a plastic wrap directly on the surface of the pudding to prevent a skin from forming, then refrigerate for 30 minutes to help the filling cool down. When the filling has mostly cooled down, remove the plastic wrap and stir, then spread over the cream cheese layer. Cover the pie with plastic wrap, then refrigerate for 4 hours until set. Beat the heavy cream with the powdered sugar and vanilla using a hand mixer until whipped cream forms and holds it's shape when betters are removed. 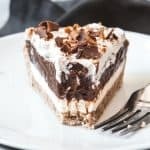 Spread the whipped cream over the top of the chocolate pudding layer and sprinkle with a handful of chopped pecans and chocolate shavings before slicing and serving. Adapted from Tie Dye Travels.